Expect foot traffic to be lower than you may expect during the winter. You will most likely have fewer showings and less traffic at the open house, so it’s more important than ever to make a good first impression. The good news is the buyers who are out and looking for a home in the winter tend to be much more serious and motivated to buy than spring shoppers. You’ll also want to keep your home warm. A good tip if you have a loud HVAC system is cranking up the thermostat a bit higher than normal, then setting the temperature back to the regular setting before you leave. This way, the HVAC system won’t kick on while the buyer is present. 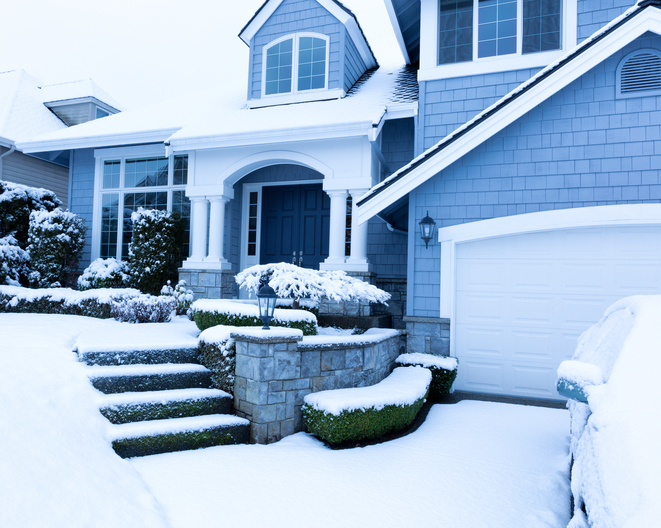 A unique challenge for home sellers during the winter is dealing with the snow and ice. It’s vital that buyers have a clear and safe path into your home, but you also need a plan to keep visitors from tracking a mess throughout the house. Stay on top of snow by shoveling the walkways often and sprinkling the path with sidewalk salt or sand for traction. When it’s wet outside, add a rubber mat near the front door for shoes. Marketing photos for your home should be done before the trees lose their leaves and the temperature drops for the best effect. This way, buyers can see what your home will look like in other seasons when the landscaping is green and beautiful. Photos of barren, snow-covered ground and bare trees simply aren’t as compelling. During the winter, days get shorter and the sun sets earlier. This can make it challenging to show the home to potential buyers if the home is too dark to really see. It’s a good idea to install landscape lighting outside if you don’t have any and bring in additional lighting in rooms that seem dim.